Okay, I was asked to post a how to for the, I guess I’ll start calling it “vanishing” hinge, since it’s not completely invisible. Anyway I struggled with posting this tutorial, because in this instance things went badly, but I think it’s just as important to publish the mistakes as the successes, because that way whoever reads this can see where the pitfalls are. So in the spirit of full disclosure, here goes. In this next picture, you can see the fence distance set to .3125 from the cutting edge of the bit. This is where I made the first mistake this time, the fence needs to be back a little further than this, probably another 1/16” so the axle of the hinge will be recessed far enough into the box to clear the back of the box when the hinge is eventually flattened down. Later on you will see the problem this caused. 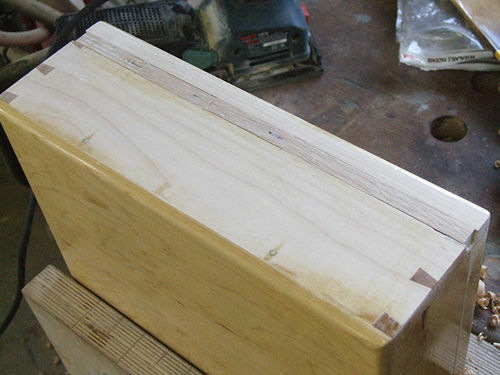 This picture shows the box I’m retrofitting this hinge to with a solid piece of 1/2” oak dowel to show the fit. 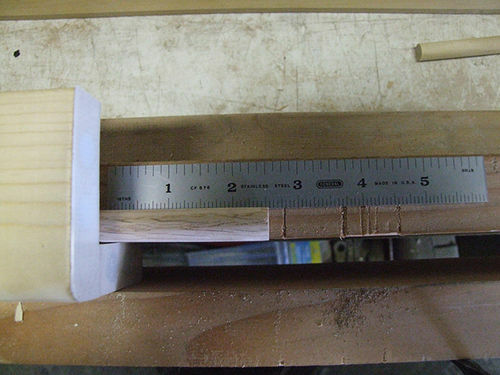 Again, ideally, the hinge would be recessed 1/16” further into the box. 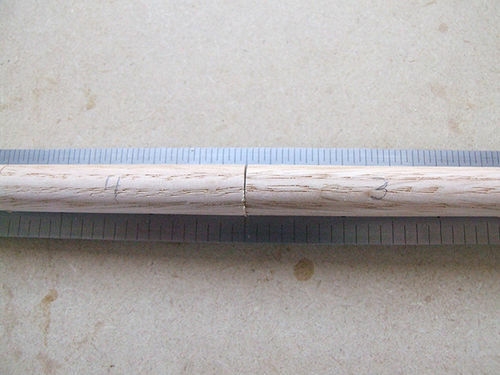 I use 5 hinge pieces for every box, so these are quite long at 2.5”. 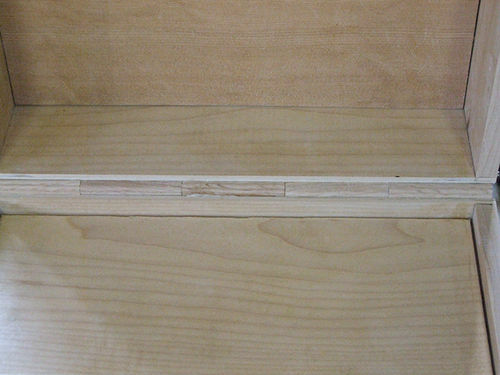 In the next 5 pictures, you can see where I numbered the hinge pieces as I cut them from the dowel, making sure to keep the grain orientation correct with the previously cut pieces. 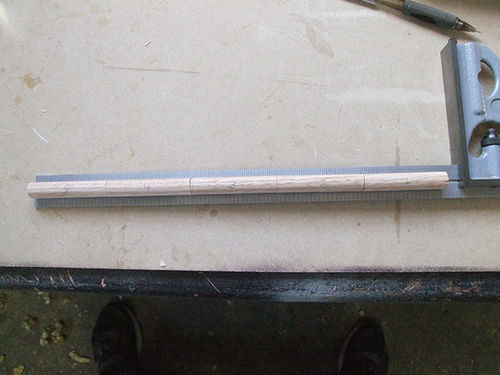 The rod is cut just short of the depth of the drilled holes in the dowels, in this case, the length of the steel rod was cut to 1” as the holes I drilled were a little over 1/2” deep in each piece that the rod would insert into. It’s important to note that the first and last hinge piece were only drilled on the inside leaving the outside solid for better appearance and also for axle retention. 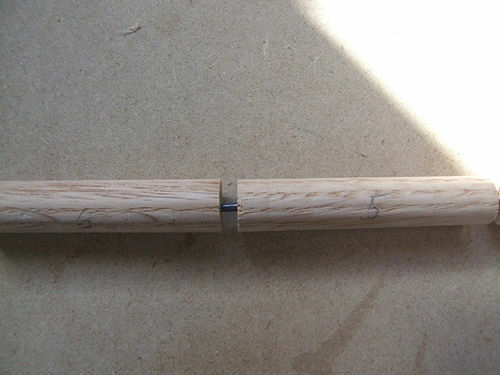 Here you can see the pieces separated a little showing the axle in between each piece. When you glue the hinge to the channel, glue 3 pieces to one half, and after it dries, the other two pieces to the other half, your choice as to which gets glued to what. Make sure glue does not travel by adding paste wax where you don’t want the glue to go. Here is where the mistake I made with the depth of the cut for the channel bit me. The holes did not drill perfectly straight because of an issue I discovered with my drill press, which I have now fixed, and when I planed the hinge down flush with the box, some of the axle pieces are showing through. You can see that I also made a mistake in measuring the hinges by not allowing for enough extra material in each dowel piece. 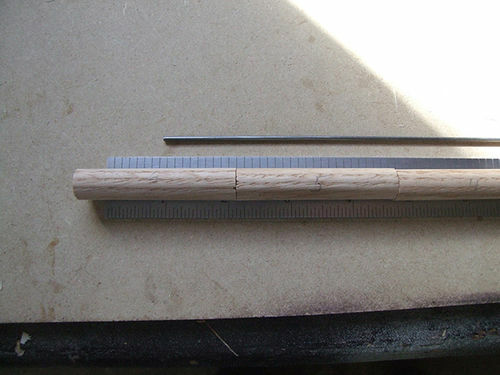 After the dowel pieces are cut,they need to be cleaned up to a perfect 90 degree on the shooting board. It’s amazing how fast those little slices build up into a lot of distance over 5 pieces. 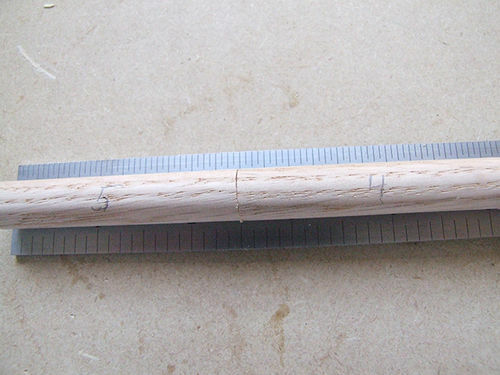 So be aware of this, you will lose a fair amount of dowel when you shoot them. My hinge wound up being about 1/8” short because of this. This is a shop box to store my hand planes in, so I’m keeping it anyway in spite of the mistakes. This is what the hinge looks like on the inside of the box. And finally here’s some video just to keep things interesting. Well done Jerry. Good thinking and great description. You will be seeing a lot of these and you will feel like a proud uncle every time you do. I bet you are the proud uncle of a lot of things on this site. Thanks Paul! Kerry my heart broke with yours when you realized you had planed through to the pin. Thanks for the tutorial. Your efforts will be rewarded when you see the many boxes using ‘Jerry’s Vanishing Hinge’. Minstrels will sing praises. Jerry my heart broke with yours when you realized you had planed through to the pin. Thanks for the tutorial. 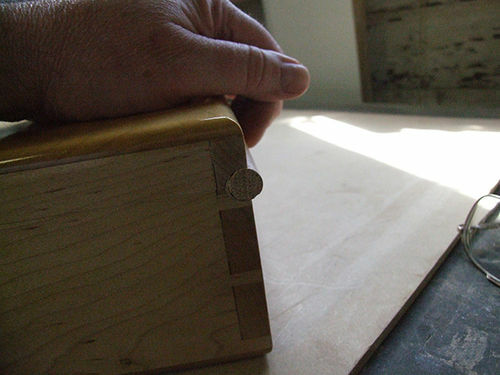 Your efforts will be rewarded when you see the many boxes using Jerry s Vanishing Hinge . Minstrels will sing praises. Jerry you’re my absolute HERO. This is the best instructions and video we have ever seen. I know many jocks will copy these. I for one will always give you credit for this. Hope you will not mind me telling folks ( my friend Jerry showed me how )Can’t wait to get to the shop and get started. I already have the box cut out just waiting for this wonderful bunch of instruction. Thank you so much. Really fine tutorial and yes we do learn from mistakes also from watching others. It’s a fine idea with these hinges so nothing is wasted and thanks for not hiding the mistakes, that takes curage. Nice to see you work. And fine to see the plane fence life. Jerry, I know this took a lot of time/effort to do this blog/video. You did a super job and I want you to know we all appreciate it. My measuring devices and router set up aren’t as nice as yours so I may have some difficulties but I’ve got to try these! Thanks and great job!! I am going to give this a shot as soon as I can get back into my shop, maybe this weekend! Appreciate the effort you took to do this!! 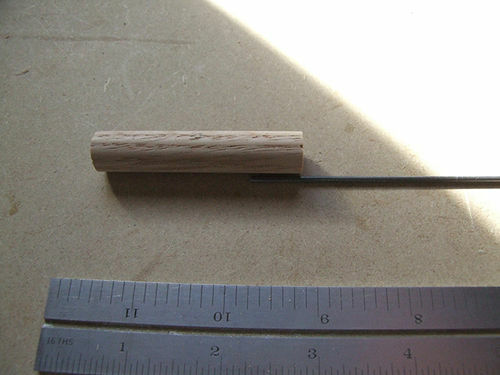 I’m still learning to turn on the lathe…. I dont NEED something else to try and master at this time. But when I DO start making boxes …. look out. I’ll DEFINITELY be steali (oops, I mean BORROWING) this technique! From your first few posts, I wasn’t sure how this invisible hinge was going to work. Somehow I just wasn’t picturing it in my mind. This blog made it crystal clear, and should be easy enough for any idiot (like me) to understand. 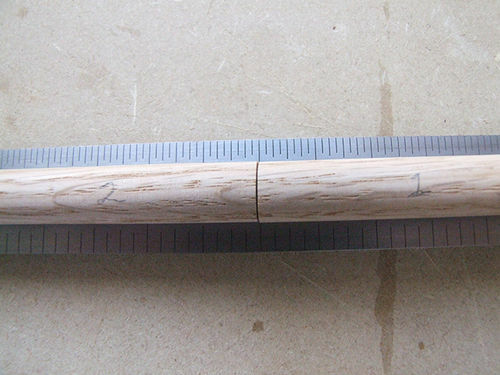 I m still learning to turn on the lathe…. I dont NEED something else to try and master at this time. But when I DO start making boxes …. look out. I ll DEFINITELY be steali (oops, I mean BORROWING) this technique! From your first few posts, I wasn t sure how this invisible hinge was going to work. Somehow I just wasn t picturing it in my mind. This blog made it crystal clear, and should be easy enough for any idiot (like me) to understand. Jerry you re my absolute HERO. This is the best instructions and video we have ever seen. I know many jocks will copy these. I for one will always give you credit for this. Hope you will not mind me telling folks ( my friend Jerry showed me how )Can t wait to get to the shop and get started. I already have the box cut out just waiting for this wonderful bunch of instruction. Thank you so much. Vernon, I wouldn’t have thought of posting this tutorial without the suggestions you and a couple of other people made, so it’s my pleasure to be of service to the community in any way I can. It s a fine idea with these hinges so nothing is wasted and thanks for not hiding the mistakes, that takes curage. Thanks for your kind words, I really don’t like posting mistakes, there are still so few mistake free finishes in my shop, but in this case, these are so finicky to get right, I figured it was important. Making these hinges is like flying a plane without wings, it just wants to crash. Jerry, I know this took a lot of time/effort to do this blog/video. You did a super job and I want you to know we all appreciate it. 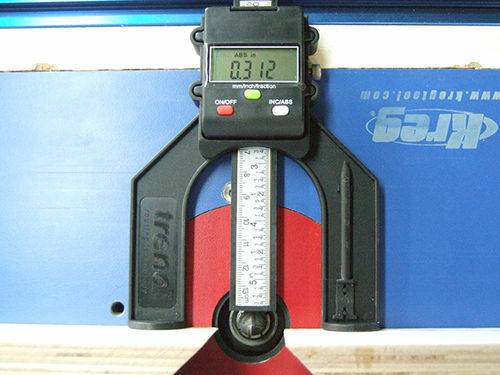 My measuring devices and router set up aren t as nice as yours so I may have some difficulties but I ve got to try these! Thank you very much! I built the router table and still have the plans if you want me to send them to you. 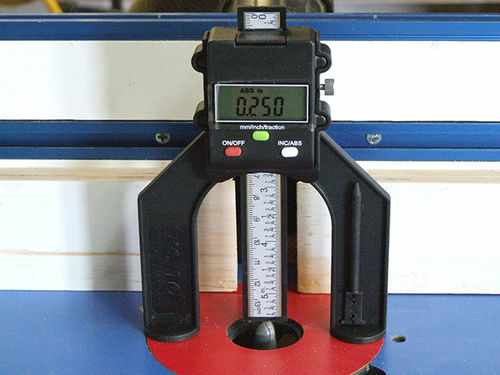 As far as the digital height gauge goes, they sell them at Woodcraft.com under the Wixey name brand for $24.95, but right now they are on sale for $19.95. Thanks Chris, good luck and please post your results!! !